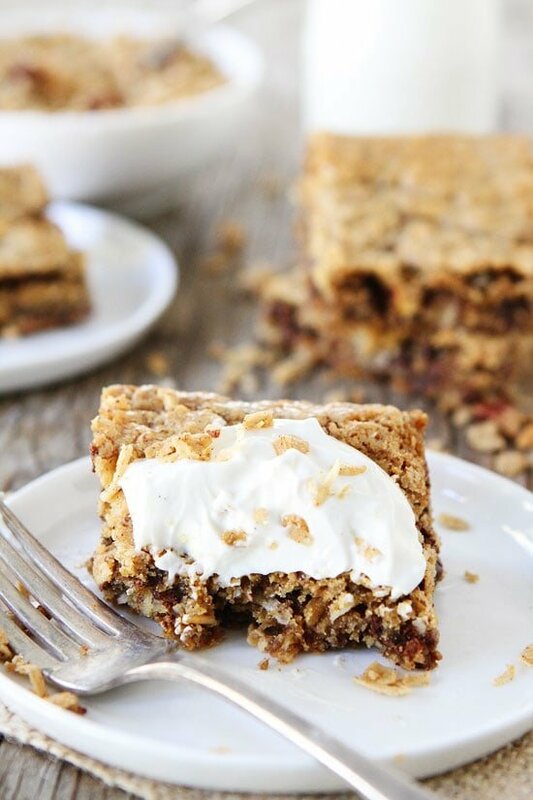 Granola Cake-a soft and chewy cake made with granola, chocolate, and coconut! This simple cake is great for dessert, snack time, or even breakfast! 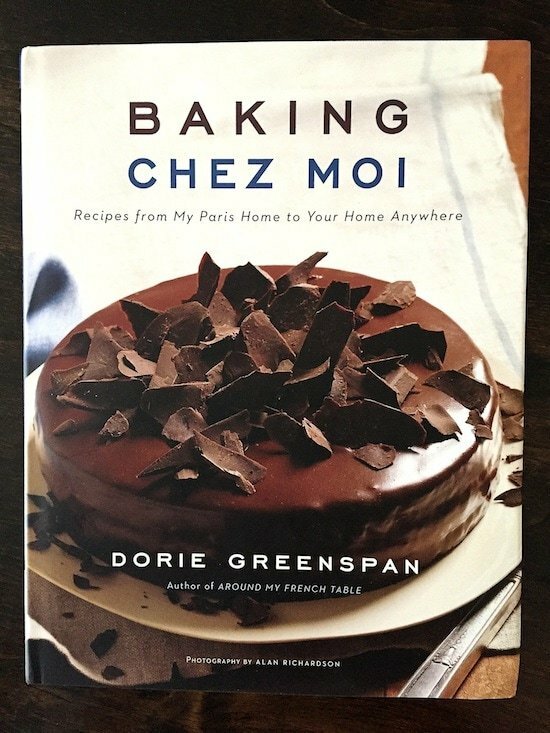 I am super excited about today’s post because the recipe for this Granola Cake comes from my new favorite cookbook, Baking Chez Moi: Recipes from My Paris Home to Your Home Anywhere, by Dorie Greenspan. Dorie is my baking idol and I absolutely adore her and her recipes. Dorie and I actually go way back. We started corresponding via email when I was in college. I didn’t have a food blog back then, I probably didn’t even know what one was. I just loved to bake and was honored that my baking idol would take the time to email me. When Dorie came out with her cookbook, Baking: From My Home To Yours, I instantly fell in love. It is hands down my all-time favorite cookbook. I gave the book to all of my family members and everyone fell in love with Dorie:) When my brother got married, my dad and I made a million of Dorie’s Lemon Cream Tartlets for his wedding reception. I sent Dorie a photo of my dad licking the lemon cream out of the blender because it is that good and Dorie got a kick out of the photo. You can read more about the story here and find the recipe for those tasty little tarts! Anyways, after Josh and I got married…and made many of Dorie’s recipes for our wedding reception, I started a food blog. I didn’t know what would become of it, but I knew I loved cooking and baking and wanted to share our recipes. Dorie has always been so supportive and I don’t think I would be blogging if it wasn’t for Dorie. She is my inspiration! Over the years, I’ve had the opportunity to meet Dorie a few times and she is even sweeter than her desserts. She is one of my very favorite people! I am thrilled for her new cookbook because I can’t wait to eat all of the delicious desserts, but also because I know how hard she has worked on this book. It is a labor of love and I am so proud of her! The cookbook is fabulous! I had a hard time choosing which recipe to make first from Baking Chez Moi. I kept telling Josh I was going to make a recipe and then I would turn the page and would change my mind and want to make that one! All of the recipes sound amazing and I can’t wait to to make them all, but I started with the Granola Cake because I LOVE granola. And granola in a cake? Even better! Dorie is a genius! I used my Brown Butter Maple Granola for the cake and let me tell you, it is SO good inside of a cake. 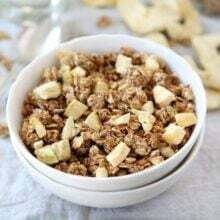 The granola softens and creates a chewy cake. 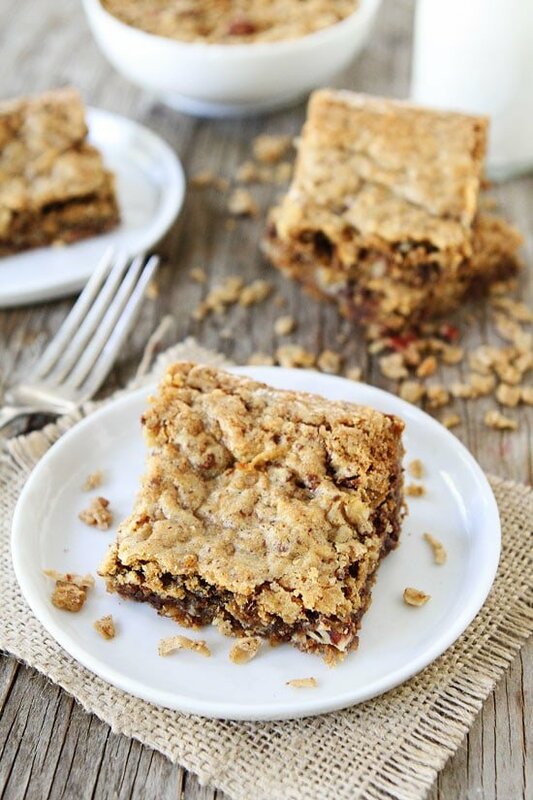 The texture reminds me more of a cookie bar…so obviously I loved it. 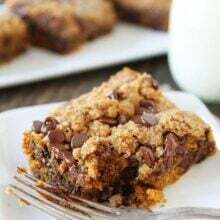 In fact, this recipe reminds me of Dorie’s Chewy Chunky Blondies, one of my very favorite Dorie recipes! The cake also has chocolate and shredded coconut inside. The cake is sweet enough for dessert, but since it is a granola cake I am considering it A-OK to eat for breakfast! I topped my piece of cake with a dollop of vanilla Greek yogurt and it was delicious! A scoop of vanilla ice cream would be good too! And I really think you should start with this Granola Cake. I am so glad I did. It is already a favorite at our house! I will be making this cake again and again! Congratulations Dorie! Thanks for bringing the sweet side of France to our home! This simple chewy cake is easy to whip up and will be a favorite! It is at our house! 1. Center a rack in the oven and preheat the oven to 325 degrees F. Butter an 8-inch square baking pan and line the bottom with parchment or wax paper. 2. Whisk together the flour, baking powder, baking soda and cinnamon and nutmeg, if you’re using them, in a small bowl. Toss together the granola, chocolate and coconut in another bowl. 3. Working in a stand mixer fitted with the paddle attachment, or in a large bowl with a hand mixer, beat the butter at low-medium speed for 2 to 3 minutes, or until soft and creamy. Add both sugars and beat for 2 minutes. Add the egg and beat until the mixture is smooth, about 2 minutes more. Beat in the vanilla and salt. Reduce the speed to low and add the flour mixture, mixing only until it disappears into the batter. Add the granola mixture, again mixing just until incorporated. Scrape the batter into the prepared pan, smooth the top and jiggle the pan a little to make sure that the batter gets into the corners. 4. Bake the cake for 35 to 40 minutes, until the top is honey brown and sugar- crackly; a skewer inserted into the center should come out clean. Transfer the pan to a rack and let rest for 10 minutes, then run a table knife around the edges of the cake and unmold it onto the rack; invert and cool to room temperature onto the racks. Note-The cake is very moist and will keep, wrapped in plastic, at room temperature for about 4 days. You can also wrap it airtight and freeze it for up to 2 months; defrost it still wrapped. It is good served with vanilla yogurt or ice cream! LOVE Dorie, so this is such a fun post! I would have NEVER thought to turn a breakfast items into a cake, but I am all about a cake for breakfast…Need this! Pinned! 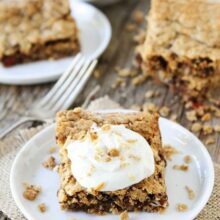 I’ve never heard of a granola cake, but wow, that sounds/looks tasty! Wow! 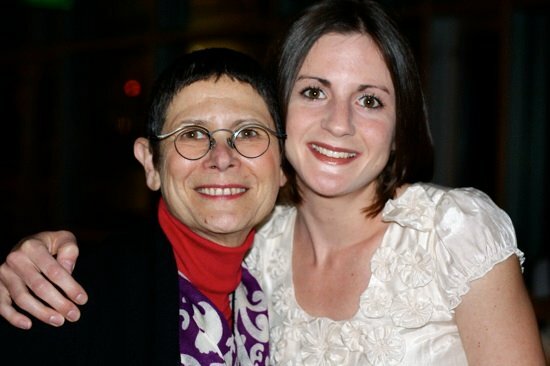 How fun that you have such a sweet history with the lovely Dorie Greenspan! This recipe looks like a winner! Looks like a delicious cake!! Dorie is so talented! Love that picture of you two! Such a cool story about your connection with Dorie! It is not often our role models turn out to be as great (or better) than we hoped. This cake looks wonderful and so unique. 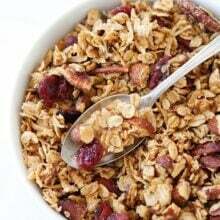 I actually just made granola, so this recipe came at the perfect time. So sweet! Baking: From My Home to Yours is one of my all time favorites!! This cake looks so good! I love that you and Dorie were email friends back in the day! Her new cookbook looks awesome!! I will not be friends with anyone who doesn’t like Dorie Greenspan (kidding! ok, not really kidding). I will also not be friends with people who don’t occasionally eat cake for breakfast (definitely not kidding 🙂 )! So fun!! Love the coconut and chocolate in this! Mmmm I love how “fall like” this cake looks — and with the colder weather quickly approaching, this cake would be perfect!! Chocolate and coconut, sign me up! Plus, Dorie is amazing!! I love the story of how you came to start your blog and the history behind you friendship (and so this recipe). Thanks for sharing! this cake – love. and dorie greenspan – I have every single one of her books. love all of them. What a sweet relationship you have with Dorie, Maria! This was inspiring to hear – and the cake looks fabulous! 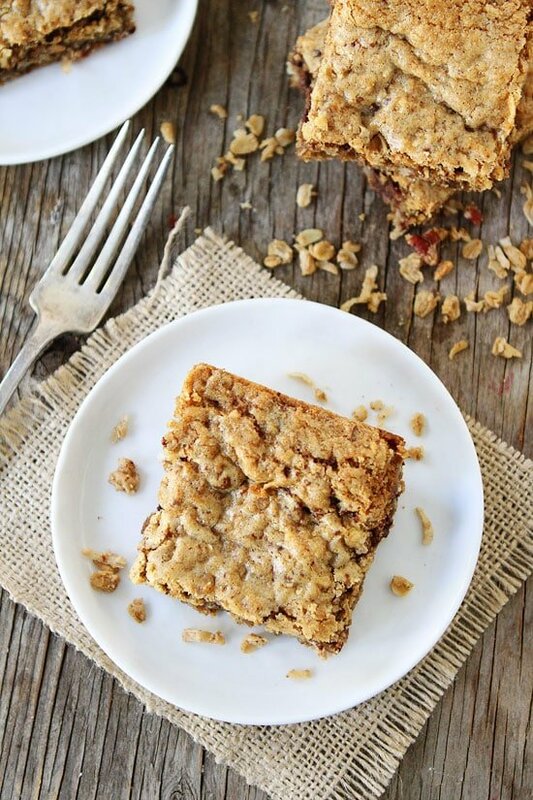 Oh wow, I wouldn’t have thought to put granola in a cake even though I absolutely adore it! Genius and I can’t wait to get my hands on Dorie’s new book! You just can’t beat Dorie’s recipes….they are fool-proof and delicious! This granola cake is something I need to make. What a nice post! I bet she will be thrilled to read this 🙂 That cake looks amazing! Cake for breakfast is my favorite, so I’ll definitely be making this! I absolutely love Dorie too!! She has been such a huge baking inspiration to me as well. This cake looks fantastic. I haven’t had a chance to pick up a copy of her book, but will be ordering it ASAP. Also, that lemon cream is out of this world. This looks so good!! I love Dorie’s recipes…they never fail to impress me. This definitely seems like another winner! this cake looks fab! love it! This is brilliant! 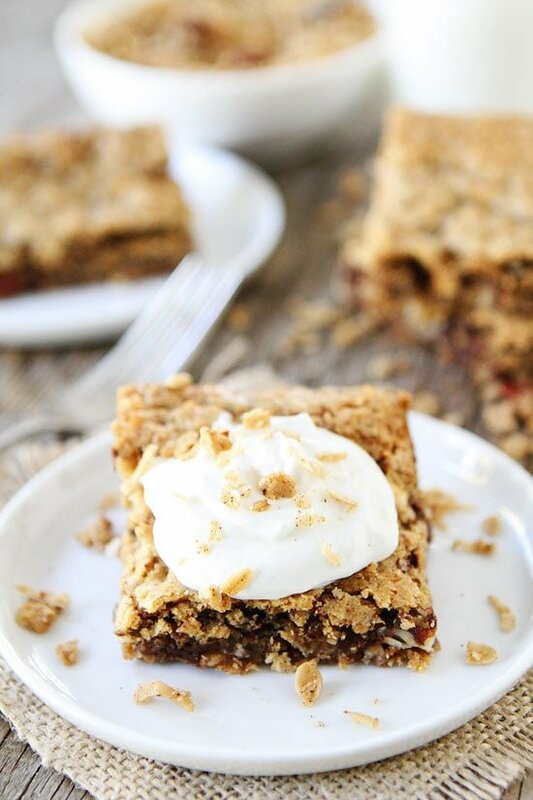 I love granola and I have a big hunch I’ll like this cake just as much! This is so perfect. Such a great balance of textures and flavors and I can easily see myself eating this for breakfast every morning. Dorie is one of those people you just feel lucky to be in the presence of. She’s so fun and sweet! I haven’t baked from the book yet but will as soon as I’m recovered! I think I may start with this cake!!! I love granola! This such a great idea for a cake. I can’t wait to check out Dorrie’s new book too. Thanks! Mmmmm! This sounds like such a good idea. That cookbook looks awesome! This cake sounds amazing!! I love the idea of granola in cake. Genius. I’m sure that cookbook is full of other incredible things too! I love Dorie’s new cookbook too. I want to try every recipe. I’d also love to have this for breakfast. I love Dorie, too. Although I haven’t had the pleasure of meeting her yet. When she posted the granola cake before the book came out, I printed it and it is high on my list to make, even though I’ve also just started with TWD. 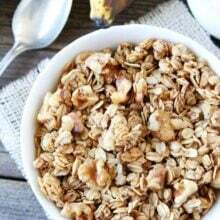 Next time I make some gluten free granola, I think I’ll make it gluten free for me. Cute picture of you and her. You should check out tuesdayswithdorieDOTcom. Bake along with us! We’ll eventually get to the granola cake! I bet this is amazing. I asked for that cookbook for Christmas. Looks like a delicious cake.! 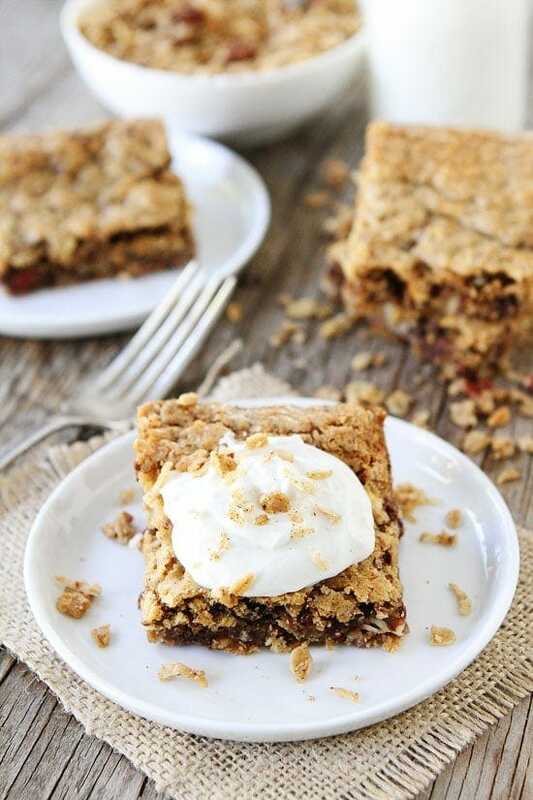 !I love the idea of granola in cake. I have every single one of her books. love all of them. Has anyone tried to make this cake WITHOUT any brown or granulated sugars? Say applesauce, or maple syrup, or honey, etc instead? My soon to be 3 year old daughter has a toy food item that she says is “brown cake with granola on top.” So I searched “chocolate granola cake” and this page was the first match. I’m thinking of making this for her birthday. Could this work for cupcakes?